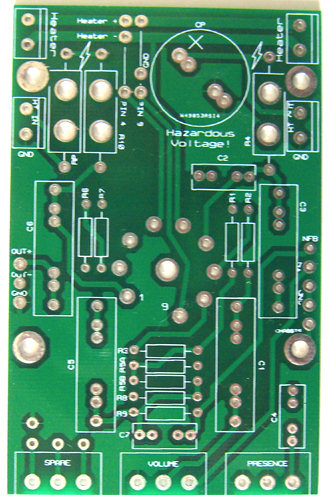 The long-tailed-pair PCB has master volume and presence pots, although you don't have to use them of course. R5B allows the LTP to be configured in the traditional guitar amp way where the tail resistor is stacked on top of the feedback shunt resistor (R8). R5A configures the LTP in a more textbook fasion where the global feedback is independent of the tail resistor. These two configurations are shown below. Space is also provided for grid stoppers, and also a speed-up cap (R7) for those who want to experiment with feedback compensation. Of course, if you don't want to use global feedback then you don't have to, just short out R8 with a wire link. On the lastest issue 2 PCBs the old spare pot has been replaced with a second volume pot, so you can build a two-channel preamp and resistively mix the signals together at the phase inverter.